The Antigravity Project on @ 9pm. Fans of The Antigravity Project and the annual Solstice Celebration called the ElementSircus were in for a huge treat. This is by far the most inspired and lineup-packed ElementSircus yet. We were honoured to be the opening band. We played a powerful set with a good mix of old and new material, video, costumes & lights. Still riding the high of this summer's festival at the Ruines des Trappistes in St. Norbert where Winnipeggers were treated to a premiere performance by Damo Suzuki of the legendary band CAN, the Absent Sound and crew invite you once again to experience the ElementSircus – celebrating the longest night of the year on the winter solstice at the Pyramid Cabaret, 176 Fort Street. Traditionally a costumed event, the evening will feature live music, performance art, dance, video and lighting shows by the city's finest local artists. 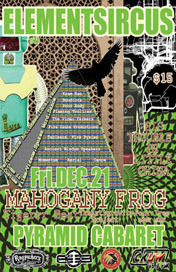 *Headlining* on 'Main Stage' will be world-class jazz-rock masters *Mahogany Frog. * Also appearing are metal-makers *Big Trouble in Little China,* ghetto-tech popsters *Tigerrr Beat* and prog rockers *The Antigravity Project. * 'Side Stage' acts include typing poet soundsters *Poor Tree* (Dave Streit, Christoff Engbrecht), chaotic experimental electronica by *Kram Ran* and skiffle master *Poor Andy* (Joshua Stanton). The ElementSircus always includes a stellar line-up of videographers and film makers – a feast for the senses – and this installation is no exception. *Bryan Besant,* who recently released a DVD with Camerata Nova called /"Wa Wa Tey Wak"/ and is currently collaborating with The Absent Sound on the release of their /"Gathering of the Clan Mothers"/ DVD, will be presenting as well as doing a video montage with the *Image Farmers*. Works by *Michel Germain* (Video Pool), *Greg Hanec* (Graffiti Gallery), *Dave Dalgliesh* (Winnipeg Film Group), and *Ed Ackerman* (National Film Board) will be mixed and projected on screens throughout the venue all night long. Live performances will be choreographed with lighting design by *Ronjan Roy* (Much Music) and will compliment the Image Farmers' video mixes. Melissa Bailey and Kelly Hientz of the *Momentum Aerial and Acrobatic Performance Group* will entertain us from above and you'll also experience a performance piece by *Boudicca* (Mike Maryniuk), that will keep your feet firmly planted on the ground. *Fire Dance Productions* presents Wild Fire, who will be doing a glow show indoors while the *Fire Pyxies* outdoor fire show, the *Flaming Trollies,* the ElementSircus signature marching band, and *Atom The Juggler* will round out the program in true sircus style. Revelers can also check out the Traders' Post, a local artisan market, participate in games and the famous Pinata Smash. New to the ElementSircus winter solstice celebration in 2007 will be presentations and commentaries by local documentary film-maker *Jim Sanders* (excerpts from his new work with Ashaninkan Shaman Juan Flores Salazar of the Peruvian Amazon and the Dakota Elders), healer and 911 truth activist *Dr. Joe Hawkins* and Cree Elder and Sundancer *Lyna Hart* who will share some ancient knowledge and bless this special celebration. The event is sponsored in part by CKUW 95.9 FM, Industry Images and Fort Garry Brewing Co. who is the exclusive supplier to the ElementSircus for this show. Doors at 7:15 pm. Opening ceremonies at 7:45 pm. Main Stage at 9:00 pm. Tickets are $15 at Music Trader, 97 Osborne, Ragpickers Anti-Fashion Emporium & Bookstore, 216 McDermot, on-line at www.mysweetspotproductions.com or by phone at The TICKET LINE 1.204.480.8565 (service charges apply) .